Create the perfect socializing and dining experience with this multifunctional table. This adjustable height pedestal table will make a spectacular statement piece in your venue. The height adjustable frame adjusts from standard table height to counter height with the handle located under the top. The adjusting height will make it your go to table for staging any occasion. The table has a narrow design so that there is plenty of room for larger tables to be setup. The round, chrome base is out of the way when guests are socializing and adds a contemporary chic design. The 360 degree swivel design of table top (Diameter: 23.6'') provides space and convenience for everybody. 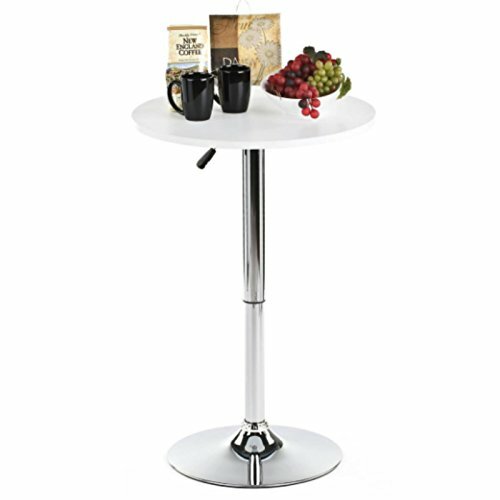 The bar table stands on a sturdy circular chrome steel base, which has a 17.5" rubber ring to prevent your floor from scratching. This high quality bar table is made of MDF and chrome steel, and it is easy to clean with damp cloth.